^ 原題『産業と貿易：産業技術とビジネス機構、及び様々な階級と国民の状態に関するその影響』, "Industry and Trade : A Study of Industrial Technique and Business Organization, and their Influences on the Conditions of Various Classes and Nations"
^ Marshall (1885), p. 57. Alfred Marshall (1885). 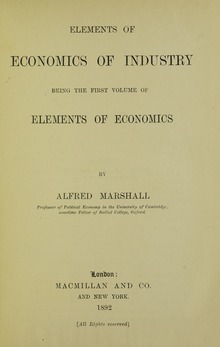 The present position of economics : an inaugural lecture given in the Senate House at Cambridge, 24 February, 1885. Macmillan and Co..
橘木俊詔 (2012). 朝日おとなの学びなおし 経済学 課題解明の経済学史. 朝日新聞出版.